Last year I virtually met Liz Danforth through Facebook and we had exchanged a couple of e-mails. We ended up being not-so-secret santas, primarily because we both thought it’d be something fun and geeky to do. I had given Liz what all women normally want (A chocolate care package… Hah!) and she had been kind enough to provide me with a few prints of her artwork which now adorn my walls. Liz’s artwork is a study in line art perfection. No, I’m really not just saying that, because it really and truly is. I knew Liz was a professional illustrator, but I was not aware of the breadth and depth of her abilities. She’s brilliant and I’m happy that she’s decided to step back into freelancing. Well, a year passed by and Liz and I had chatted online a bit about how she wanted to get back into illustrations. (You can imagine I was cheering her on.) Then, we happened to meet up at Neoncon in Las Vegas and we were able to chat about her new beginnings. Neoncon is a convention held in Las Vegas that has, at its core, a vision that isn’t just about gaming. It’s also to connect creative professionals with others to help them in their quest to develop their careers and find new opportunities. This year, I hosted a few panels to share my knowledge and see how people might respond to my style of speaking. I was happy to finally meet Liz for the first time; we had a great conversation and she seemed really excited about new possibilities. Well, a few weeks ago Liz had posted Gearing up in the Next Expansion at LizDanforth.com. Earlier, I had asked her to provide some insight about my talk, because that feedback helps me grow. As you can imagine, I was pleasantly surprised. As I’ve gotten older, I’ve tried to adhere to a simple philosophy: There are six billion people on the planet. Everyone has a different way of doing things. That way is not my way. Instead, I want to listen to their stories. Sometimes it’s challenging to balance the listening part with the advising part, but that’s an area that I’m growing in. It was nice to hear that I’m achieving that goal. I’m hoping to make it out to Neoncon next year, too, though I’m not sure what I’ll be doing. Such is the life of a creative professional, but one that is a lot of fun. After all, I probably wouldn’t have been able to meet Liz otherwise. I am pleased to announce that my short story entitled “Fangs and Formaldehyde” will be published in an upcoming anthology from the newly-launched publisher Stone Skin Press. The theme for this anthology is about iconic characters. The idea is so “big” that they’re publishing two of them! The iconic character I created goes by the name of “Atlas” and he’s a vampire who helps other vampires. In my setting, vampires are not the romanticized kind that well… Glitter. They are the kind that feed (and feed regularly) on humans. To them, we’re food. If you’ve read any of my other stories, you know I often build worlds for my characters to live in. This story is no different and could easily be part of something bigger. I won’t give any more away, because to tell you what my vampires are all about will spoil the surprise. Be sure to watch for news about how you can get your hands on a copy of New Heroes or New Heroes Two, edited by Robin Laws. With names like James Lowder, Matt Forbeck, Ed Greenwood, Alex Bledsoe, Kyla Ward and Monte Cook in the mix, I can guarantee that you won’t want to miss out. As you know, I’ve been looking for new professional opportunities. After posting about my pursuit, I had a good discussion with Jason Sizemore who runs Apex Book Company who decided to help me out while I continue to look for a full-time job. For a few hours a month, I’m going to be consulting and directing their marketing efforts to help coalesce their initiatives into a big picture strategy I’m designing. Apex has a really smart and dedicated team of people in place that the previous Marketing Director, a lady by the name of M.G. Ellington, helped put together. My efforts will be behind-the-scenes. I’m really excited about helping Apex for a few reasons. Months ago I turned to a few recruiters who suggested that since this is an employer’s market, in order to get a good job, I really need to keep my online marketing and writing skills fresh. I’ve been able to do that with my writing, because like so many writers, that’s something I’ve always done, even when I was working. Now, I’m able to elevate my visibility for online marketing and pad my resume a bit. Another reason why I’m happy to provide a few hours of marketing support for Apex, is because this is my chance to apply six years of online marketing knowledge to the publishing industry. Apex produces quality books, anthologies and a magazine. Jason has made it clear that I wouldn’t be given any special treatment. So, if I want to publish a story through Apex, I better write a good one. Believe me, I am doing everything I can to step up my writing and my career to new heights. I’m excited, because ever since I posted my news about how things have been going, so many people like Jason have reached out to me cheering me on. I don’t know what 2011 is going to bring, but I’m ready to find out. If you’re job-hunting like I am, I really hope you consider reaching out to uncover potential opportunities–regardless of whether it’s a volunteer position or a few hours a month. I know I am. Today, I watched the FCC hearing on Net Neutrality before they took their vote. I listened to speeches, both for and against the order, and I heard the vote. Already, both sides of the fence are reacting. FCC Breaks Obama’s Promise is just one of many articles on the subject. So, my answer is: too early to tell, especially since this order excludes mobile. Once this gets caught up with legal, it could be months or years before this gets sorted out. Just how important is a book’s cover? Well, I’m going to find out. 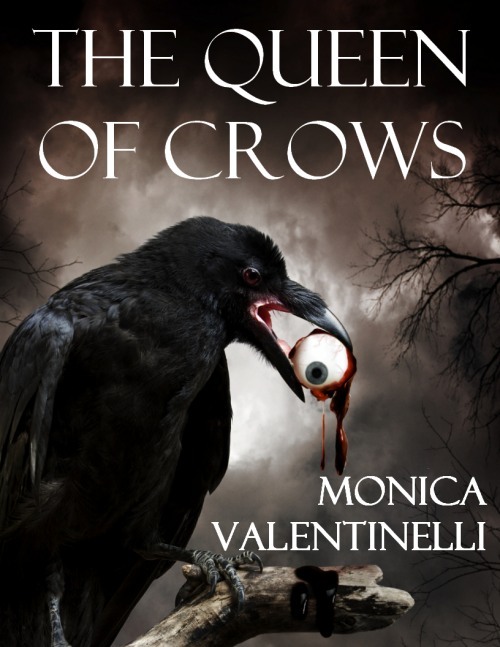 After a tip from Lori Devoti, I decided to try a different cover for the Kindle and Nook editions of THE QUEEN OF CROWS. I was going to add a starburst that read “bonus content included” but going to try this first.